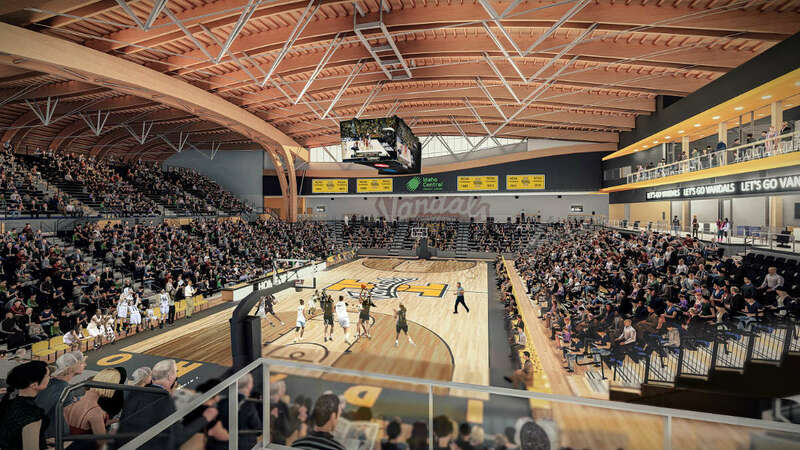 With open space that will fill with cheers and Vandals of all eras standing shoulder to shoulder, the Idaho Central Credit Union Arena will showcase all that is right about the University of Idaho, Vandals and the state. The arena will not only be a home for Vandal court sports, but also a gathering space for a variety of events to enhance student life on U of I’s residential campus. The arena also has become a priority for students. In 2015-16, the U of I student body agreed to assess a fee against itself to financially support the project. “I’m grateful our students share that enthusiasm for the future of Vandal Athletics and our residential campus,” Staben said. Preliminary plans include the arena to be made in large part with wood and wood products using a contemporary building technique that blends thousands of years of construction technology with modern desires to use renewable materials. Plans for Idaho Central Credit Union Arena include the main Vandal home court, practice court, men and women’s locker rooms and conference space, as well as coaching and staff offices.